OFFLEASEONLY WANTS TO KNOW WHAT'S IN YOUR DRIVEWAY? OFFLEASEONLY WANTS TO KNOW WHAT’S IN YOUR DRIVEWAY? Click the image above to enter to win a $20,000 OffLeaseOnly Car Voucher! This is your chance to win a $20,000 OffLeaseOnly Car Voucher! And it’s so easy to play! Simply snap a pic of your ride and then log on to Win20kCar.com to enter to win. The website is super easy to use and will walk you through just a few steps, and BOOM you could be the lucky winner. Not to mention, you can put the voucher towards ANY vehicle in OffLeaseOnly’s Massive 6000+ used car, truck, suv and van selection, and $20,000 goes a LONG way at OffLeaseOnly! Almost sound too good to be true? That’s what our most recent winners thought as well! Josh with his beautiful family excited in front of their OffLeaseOnly Chevy Silverado! 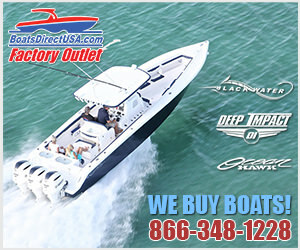 Josh Tomblin from Fort Pierce, FL was OffLeaseOnly’s last lucky winner. He heard about the contest on Real Radio 94.3 and decided to take a pic to try his chances. Well the odds were certainly in his favor as he ended up getting the call on July 31st just a little after 5pm. Josh searched through the OffLeaseOnly.com website pondering what kind of work truck he would decide upon. 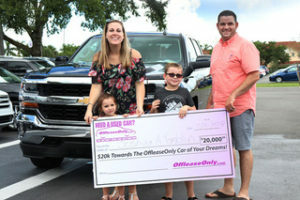 Once he had his choices narrowed, he brought his family down to Off Lease Only North Lauderdale, and ended up choosing an OffLeaseOnly Chevy Silverado with his $20,000 voucher just days after winning! 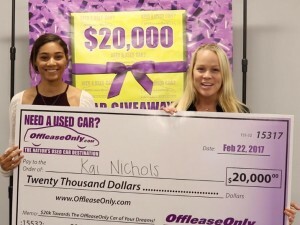 Off Lease Only’s last $20,000 Car Voucher Winner Kai spent her check on a Lexus last year! Kai Nichols from Orlando, FL was another lucky winner who chose a beautiful OffLeaseOnly Lexus. She thought a friend was playing a joke on her when she got the call. Fortunately for Kai she didn’t hang up and after looking at OffLeaseOnly’s incredible selection of pre-owned BMW’s and Lexus’, she decided on her sporty OffLeaseOnly Lexus. “We love giving back to our loyal customers and potential customers. This is going to be a fun contest!” said founder Mark Fischer. Entering to win will take just a minute or two, and your odds are definitely better than playing the Lotto! Enter Now for Your Chance to WIN a $20,000 OffLeaseOnly Car Voucher!!!!! Plus its FREE to enter! 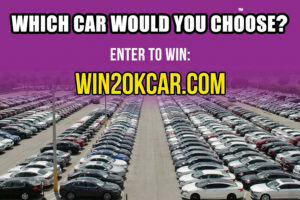 Log on to Win20kCar.com to enter and make sure to spread the word to all of your friends! Contest runs from November 1st-30th, with the grand prize drawing happening at 5pm. 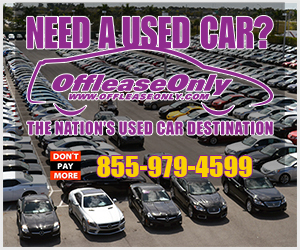 Want to check out the OffLeaseOnly used car, truck, suv and van inventory in person? Simply click on the OffLeaseOnly Locations image below for driving directions! ← Previous Story Online Used Car Giant OffLeaseOnly Boasts Largest Inventory Ever! Next Story → ONE MORE DAY TO ENTER TO WIN THE $20,000 OFFLEASEONLY CAR VOUCHER GIVEAWAY!